The continuous improvement of tailings management is an integral component of successful oil sands mining operations. Reducing the size and need for tailings ponds, and increasing the speed with which they can be reclaimed, are ongoing challenges being addressed by the industry. Canadian Natural has taken significant steps to manage tailings, minimize our environmental footprint and advance reclamation as quickly as possible. Our comprehensive land use planning is an essential part of our operations that considers the end of mine life so that we can manage our environmental closure programs and obligations, and apply progressive reclamation activities. Canadian Natural has invested more than $3.5 billion in tailings research, technologies and project construction. Our tailings management technologies are the result of extensive research that can be applied on commercial scale. This exemplifies our approach to research and development, taking lab concepts through the pilot stage and on to commercialization. Tailings are the sand, silt, clay and water found naturally in oil sands that remain following the mining and bitumen extraction processes. Tailings are transported by pipeline and deposited into ponds, where the majority of the solids — mostly sand — settle to the bottom. The remaining fluid — water, with some clay and silt — is called Fluid Tailings (FT). As the solids in the FT begin to settle, the FT densifies, turning into a mixture called Mature Fine Tailings (MFT). Some of the MFT remains in tailings ponds, trapping water and reducing the amount of water available for recycling. Our tailings management strategies align with regulatory requirements based on two key principles: 1) creating landforms that fit within the local landscape, and 2) supporting productive wetlands and boreal forest habitats. Our tailings management processes focus on preventing FT through optimization and continuous improvements, dewatering tailings (increasing the release of water for recycling), and improving tailings consolidation over time, to ultimately accelerate the reclamation process. To do this at Horizon, we proactively manage the fines before they become part of the FT by using a Non-Segregating Tailings (NST) process that includes carbon dioxide (CO2) injection. These processes combined are the foundation of our tailings management plan. NST are tailings that have been significantly treated (dewatered) to form a homogeneous, semi-cohesive mass when deposited. The dewatering process is achieved by adding two steps to our original process: we use cyclones to separate the coarse sand, and thickeners to capture and remove water from the fines in the tailings stream prior to being sent to the tailings pond. The warm water that is removed and recovered is then re-used in our bitumen extraction process. The coarse sand and thickener underflow are then mixed and further combined with CO2, which has been proven to accelerate the settling of the fines and NST as a whole. 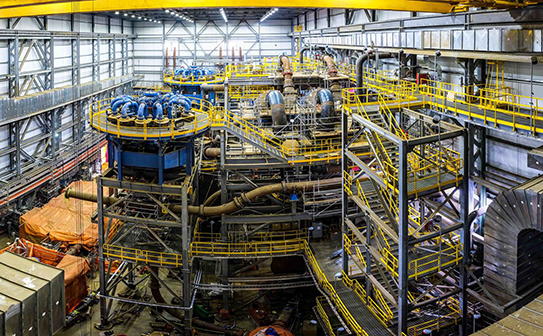 At the AOSP mines, Canadian Natural is continuing the work on centrifugation technologies at the Jackpine Mine (with four centrifuges that separate water out of the fine tailings), as well as the Atmospheric Fines Drying (AFD) technology that uses a chemical to help settle out solids in the FT, and composite tailings at the Muskeg River Mine. These technologies are combined with the use of thickeners at both AOSP mines. These innovative methods will accelerate the process of reclamation by increasing water recycling and reducing the tailings footprint, while also reducing CO2 emissions. Canadian Natural is also investigating tailings reduction technologies that are designed to deal specifically with MFT, by reducing the amount of fines in the process. continued reducing GHG emissions through warm process water recycling across our Oil Sands Mining and Upgrading operations (as water does not need to be re-heated), and through CO2 injection in the tailings from Horizon’s new CO2 capture plant. We also initiated research and engineering of NST reclamation with the University of Alberta to evaluate the effects of NST on plants growth during reclamation. Through experimental design, we will examine growth and physiological parameters on 20 native boreal forest plant species, including plants of special significance to Indigenous communities. Trials will include different types of NST and cover soil combinations, and planting vegetation directly into the NST. Testing and developing technological and process improvements in tailings management practices requires access to authentic samples, high quality industrial equipment and knowledgeable personnel familiar with mining operations. With ongoing research being an important piece of our tailings management strategy, Canadian Natural built and commissioned the Applied Process Innovation Centre (APIC) at the Horizon site in 2015. The APIC, a 3,600 square foot research facility, provides a dedicated work space and resources for scientists and engineers to investigate and accelerate the application of tailings technologies to commercial scale. It also facilitates collaboration on research with other industry members directly and through COSIA. At the APIC, we are continually searching for breakthroughs. The facility is primarily being used to further develop and enhance tailings management methods, including thickened tailings production, NST, CO2 sequestration testing and MFT treatment. For highlights of our 2017 tailings research at Horizon and AOSP sites, read the Advancing Innovation section in our แอพพลิเคชั่นเกมยิงปลา W882017 Stewardship Report to Stakeholders. We have been adding purchased CO2 to our Horizon tailings since 2009 to enhance solids settling rates, keeping the pond at roughly half the size it would have been without that process. The CO2 is added into the tailings stream before it enters the pond, where it creates a chemical reaction that changes the tailings water pH to be the same as river water, allowing the solids to settle more quickly. This accelerated settling enables the quick release of clear and warm process water for recycling. Horizon's new CO2 recovery plant has a capture capacity of 438,000 tonnes of CO2 annually — the equivalent of removing the emissions of 92,000 passenger vehicles from the road. Horizon’s CO2 capture plant is part of our hydrogen plant, which produces 144 million standard cubic feet per day of hydrogen that is used in secondary upgrading to stabilize the synthetic crude oil and reduce impurities. Through a commitment to continuous improvement, our Oil Sands Mining and Upgrading operations are achieving extremely important environmental and efficiency objectives. These accomplishments are important for the oil sands industry as a whole, which sees producers collaborating to accelerate the pace at which we can all enhance environmental performance. Our tailings plan includes what we learned from our processes and research, as well as technologies developed by our peers and shared through แอพพลิเคชั่นเกมยิงปลา W88Canada’s Oil Sands Innovation Alliance (COSIA). Left: Current tailings pond with CO2 added. Middle: Without the addition of CO2 the footprint of our tailings pond would be almost double the size. Right: Horizon CO2 recovery complex.